Samsung is about to unveil a successor of Exynos 9810 processor on coming 14 November, this processor will be used in upcoming Galaxy S10. This was confirmed on Twitter by the South Korean Giant. Name of the chipset is not yet sure, but according to the habit of the company, it could be called as Exynos 9820. 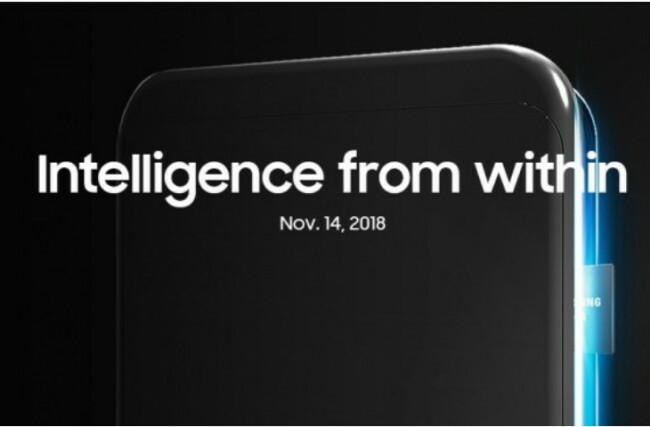 Samsung teased that its next chipset will be featuring “intelligence from within” which also gives a clue at a neural unit for the chip. This processor will be the first Exynos SoC which will be produced on advanced 7nm LPP process which relies on the EUV lithography technology. With this process technology the power consumption will be improved by 50% and the performance will be enhanced by 20% as claimed by Samsung. Few reports also suggested that the neural processing unit will be having a dual-core artificial intelligence SoC to performing more complex AI and machine learning task to making the device more intelligent. Some reports suggest that Galaxy S10 will be coming with a separate 5G enabled model. The processor for that will support the 5G modem and the company is working on Exynos 5100 modem for bringing the 5G capability to the smartphone. We have to wait a few more days until the complete launch event takes place as the company did not mentioned much for the same. Stay tuned to Alloftop for more updates on this.